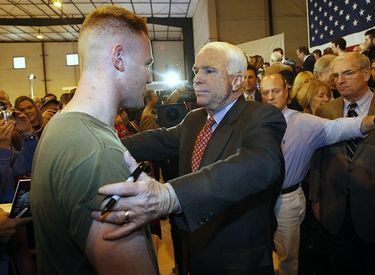 In this time of cynicism and hopelessness, I reach back to when my son, former Marine Corporal Gav Jacobs, met one of his idols, Sen. John McCain. It was 2008, and my son was at Balboa Navy Hospital in San Diego learning to walk with his new prosthetic leg. Like McCain, my son’s life was forever altered by war. In 2007, he was on patrol in Anbar province, Iraq, when his tank rolled over a roadside bomb. He suffered massive injuries, and endured a long road of surgeries and rehab. When I look at the photo of McCain and my son, I see two men of valor and strength of character. I was appalled when President Donald Trump refused to properly honor McCain’s passing as a war hero. Only with pressure from enraged veteran groups did he do so. Trump’s shameful behavior not only betrayed McCain and his family but all veterans who have given so much to this great land of ours. I continue to hold onto the hope that one day, men such as McCain and my son will restore our country to a land of truth, integrity and courage.